It doesn't matter if you are a seasoned recording veteran or a relative newcomer to the home recording world, both share one fundamental similarity. The cost of owning musical gear can really add up. FAST!!! And let me tell you that the longer you are in the hobby, the better (or worse... depending on who you ask) it gets. In my case I have recently moved cross country which allowed me to pair down my music equipment collection, which had grown to the point of becoming a minor nuisance. and enough cables to tie up a medium-sized grizzly bear. The point being that I had A LOT of money wrapped up in my equipment. Over many years it can be easy to forget how valuable (and expensive) some of these things were back when you first got your eager hands on them. 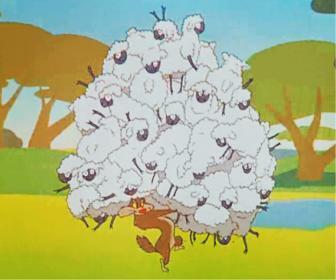 But there are some steps you can take to keep your Flock of Musical Sheep safe from the Big Bad Wolves out there. Let's first take the possibility that your belongings may be taken as a result of mistaken identity. This happened to me a lot when I would play out live. Me, my fellow musicians, and even the venue itself, would get criss-crossed, confused, and downright befuddled about whose stuff was whose. I believe this wasn’t the case of deliberate thievery, but rather the fact that we all had very similar gear. At the end of the night you see something that either IS yours, or LOOKS just like it, slam it in your bag, and hit the road for home. My direct boxes and mic cables, for example, were constantly ending up in other peoples’ cases. Luckily I had labeled them in "very-annoying-to-remove" and "sticky-residue-leaving" tape. Another, even more effective, tactic would be to etch your name in an out-of-view place so you can know that it’s yours after a quick glance. This can be done with a simple pocket knife or a Dremel Tool (if you're feeling fancy). So label your gear and continue beboping, wailing, and jamming with your musician friends without walking off with each others stuff by mistake. Now there’s basically 2 ways to handle the more sinister means of losing your hard-earned possessions, and the first is the more passive of the two I'll discuss. You may already have renters or homeowners insurance, but even if you do it’s essential that you photograph your equipment. Not a picture of you in front of it, or of all your stuff in the background, or even of all 50 things you own in one panoramic shot. The best thing to do is to take a picture centered on the manufacturer's serial and part numbers while still showing enough context so that you know what it is. Many times this label will also give additional info, but for some items it’s a very generic looking code. This will be golden if you ever do need to file a claim because you have proof of exactly which model number you had as indicated with a time-stamped photo. Also, I recommend doing this right after you buy something. Believe me... you won't feel like doing it later either, so it's best to get in the habit of doing it as soon as you add new gear to the mix. For those that are looking for a more active solution, then you might want to consider a home security system. This could be anything from a total burglary setup, to simply installing a wi-fi camera with a motion sensor that emails you when it detects movement. The second could come in particularly useful if you are hosting a party and will likely have a lot of people in your home that you may not necessarily know well. This could give you a better feeling that no one will wander into your sonic sanctuary and walk out with your killer Stratocaster, one-of-a-kind didgeridoo, or whittled-from-a-single-piece-of-beechwood-kazoo! Just like the consumer music industry, although camera systems like this may have at one time been solely for the rich and famous... now they are accessible to the masses. Of course, if you only have a guitar and an amp this may be overkill, but as your collection grows you will likely find that you are in possession a mighty valuable cache of equipment. Make sure you evaluate your stash often and take the necessary steps to keep your treasure safe.